Catholic Bibles: Didache NABRE Discount Ends Tomorrow! 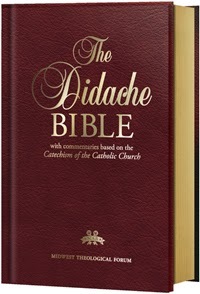 The Didache NABRE will begin shipping on Friday. If you want the discount through MTF, you need to pre-order by tomorrow! Pre-order here. This edition uses the New American Bible, Revised Edition translation of the complete text of Sacred Scriptures, Old and New Testaments.The Didache Bible also includes numerous apologetical inserts to assist the reader in understanding the Church’s teachings on current issues. For the leather edition, the pages are gilded and the page corners are rounded. It is fascinating how the two sets of notes in this bible can juxtapose each other, and it may only add to the chorus of complaints against the NABRE notes, by making it so easy to see how unorthodox they often are. 1:26 "Let us make": in the ancient Near East, and sometimes in the Bible, God was imagined as presiding over an assembly of heavenly beings who deliberated and decided about matters on earth. This scene accounts for the plural form here and in Gn 11:7 (“Let us go down…”). Israel’s God was always considered “Most High” over the heavenly beings. 1:26-27 "Let us make": Christian tradition has long understood the use of the plural here as pointing possibly to the fact that each Person of the Trinity was involved in the act of creation. Thank God for the Didache notes! As pointed out in a previous post, you are comparing the philology of the NABRE footnote with the theology of the Church. They are not the same thing. The NABRE footnotes deal mostly with language, etymology, the analytical evidence that confronts linguists who must make a decision on how the meaning of a text must be arrived at in order to translate it properly. As a methodology, philology requires empirical evidence, testing the data, and having the results verified by disinterested parties. Once in a while these footnotes touch on Tradition and doctrine, but this is not the reason for having footnotes in a translation. it's a science of manuscript transmission and rendition. A study Bible like the Didache adds theology and doctrine. Doctrine comes from revelation such as the theophanies given to Abraham and Moses and the epiphany the early Christians had from living and learning from Jesus. Revelation does not come by means of analysis such as required by a methodology as empirical evidence is often absent. Faith is required to accept doctrine and often stands alone because we are dealing with transcendent truths, not data which can be gathered, tested and measured. To illustrate, the NABRE footnote you quote offers the linguistic science behind the terms that have been translated, while the study information from the Didache offers the doctrinal theology or Chruch interpretation of the verse. One offers the nuts and bolts behind the meaning of the words and the other is faith's enlightenment from the Spirit. The footnotes in the NABRE aren't unorthodox or heretical as much as they are read by some as if the technical footnotes are study notes or a commentary, which they are not, If they were it would be a ridiculous notion to make a study Bible version of a study Bible. CarlHernz you may understand that but I wonder how many other less technically equipped Catholics do? The NAB note is the human information behind the verses in question. The NAB note explains a possibility (not a doctrinal absolute truth), a theory, of what the original authors may have had in their minds when they wrote what they wrote. The NAB note is the note which pertains to the HUMAN authorship and the human side, with the divine side only being taken slightly into account. Also, the NAB note tends to focus on the LITERAL / Historical meaning of the text. That is one of 4 different ways of interpeting the Bible as a Catholic. The Didache note is from the Divine Side. the Didache note sees that God the Spirit inspired this verse to be a type of the Blessed Trinity. The human author had no idea what the trinity was, and he did not have the Trinity in mind when writing. God had it in mind though, and God guided the human authors ideas from surrounding cultures to align with Gods Soverien plain and voila. That is how we have this passage. Also, the Didache note focues more on the spiritual interpretation, which is made of 3 subparts - allegorical/typological/Christological, tropological/moral, and Anagogical/heavenly/eschatologically. I hope I am making some sense, and I also agree with every word Carl wrote as well. I once had a real hard time with the NABRE notes, but after many hours of studing I have come to actually appreciate them and the NABRE is my main Bible together with the Douay Rheims. God bless, and pray for me please. You are right. Apparently a lot of Catholics are confused, and I myself have complained that the average Catholic has not been given a chance to catch up with the language and understanding of our Scripture scholars. While it is great that new study editions like this one are being produced, these editions are expensive and there's no way of reaching each and every Catholic with the vital information found within. A large portion of the Church is very poor, and spending almost $50 on a volume that uses technical speech many might not understand anyway--well I don't think this is what our Lord had in mind when he said: "Without cost you have received; without cost you are to give." --Matthew 10:8. Don't get me wrong, I know that Scripture also says that "the Lord ordered that those who preach the gospel should live by [means of] the gospel." (1 Corinthians 9:14) But lack of education in higher (or basic) studies of Scriptire should not be dependent on one's access to funds. The gap in misunderstanding the critical data in the footnotes of the NABRE is unfortunately tied to a lack of access to Bible education by Catholics who are of limited funds, means, and otherwise disadvantaged like the disabled. People need to be educated in how to understand the footnotes in the NABRE, but they also deserve and have a right to this education that should not be limited by whether or not they can pay for a Bible. It's the same problem I have with the Divine Office in that the Church wants everyone to pray it but access to it can cost over $100 for all four volumes. I think we as the Catholic Church should and can find ways of ensuring that all the faithful have access to practical Bible education regardless of their station in life, but I fear many people may not realize how great this need is. We need to do more than merely discuss the Bible among ourselves. We need to be equipped to bring it to people, literally. Jesus has a Divine Nature, He is fully God. Jesus has a human nature, He is fully human. The Bible has a human nature, which is revealed in the NABRE notes and through that approach. And it shows itself to definitely be fully human. The Bible has a Divine Nature. This is revealed through Prophecy, through Christ and the New Covenant, through the infallibility of the Scriptures, and to the Divine Triune Deity which they reveal. This Divine nature is what is more focued upon in the Didache notes. Imagine if an author wrote a life of Jesus and wanted to only reveal his human nature. He would write a book about all the human things about Jesus and explain about Jesus human nature. If another author wanted to write a biography of Jesus Divinity. He would write a book and show all the Divine Aspects of Jesus. The NABRE is author 1, the Didache is author 2. CarlHernz and Sarah Prewar - you are doing a valiant job in defending the NABRE notes but I ve read enough criticism of these notes to know that not all scripturally educated Catholics think as you do. Sorry about that, but I just cannot get to grips with the idea that people have to have some sort of further instruction or education in order to have the notes correctly understood. We have the very thing they're talking about taking place in the Book of Job. Which, I might add, they referenced along with a bunch of other texts. The Interview Between the Lord and the Satan. with the NABRE notes might just make this the preferred vesion of the Didache Bible. Actually I am not exactly fond of the NABRE's footnotes. "We ought to explain the original text which was written by the inspired author himself and has more authority and greater weight than any, even the very best, translation whether ancient or modern. This can be done all the more easily and fruitfully if to the knowledge of languages be joined a real skill in literary criticism of the same text." --Divino afflante Spiritu, 16. I agree with the words of Pope Pius XII that this "literary criticism of the [Biblical] text" is essential to Catholic Bibles. But I have a love/hate relationship with the NABRE even though I use it as see it's value. However its footnotes are not as clear as they could be, in my humble opinion. The JB and NJB have far more "critical" notes, but the translators show the practicality of the data in service to Tradition whereas the reader of the NABRE is left to guess at how to make this connection (or even conclude that such a connection exists). While I am resigning to reading the texts in their original forms, when it comes to choosing a Biblical text in English I do not do so because it agrees with my views or I find that it fits my tastes. In fact I do the opposite. I find one that challenges me, keeps me on my toes, and often brings me information that keeps me from being in a comfort zone with my faith. I can only speak for myself in that I know my weaknesses too well, how I would rather have things be clear and easy to accept. I am prone to want to be in the right and search for evidence which supports my preferred views instead of searching out criticism that might correct me. Because of this truth I keep myself in check by never allowing myself time in that comfort zone I yearn for. For me having a relationship with God is learning how to be less like myself and more like Him. I don't know about the rest of you but for me that is very hard. I'm a selfish being. So for me I look for checks and double-checks about what I accept as valid. I admit that my own self-centered imperfections require a fail-safe. Due to this I never trust my own instincts in this department and realize I am more likely to lie to myself that I am right than I am to be honest with myself and admit I don't really know anything. It's a critical approach to my own convictions, and believe me without the help of others from the outside telling me what I often don't want to hear I would still be lost as a non-believer. Don't purport to know my views or where I stand on a matter so easily by what you read from a few of my comments. Just like you I am far, far more than a few typed letters you can read. Carl, you're too hard on yourself! You made good strong valid points: human and Divine. The Didache will give us both. I am greatful for your input as I am sure others are also. Just making a point, albeit with a little help of a narrative device: dramatization. People are generally rarely hard on themselves. We don't go around thinking we are incorrect regarding any of our convictions. We pat ourselves on the back for our cleverness. Everybody else feels the same way you do about your convictions. The atheist, the heathen, the Jehovah's Witness, the Mormon, the agnostic, etc., all feel the same way about their convictions that we each do: we all feel we are right and have based our convictions on solid evidence. You see, people have no inner gauge to tell them when they are mistaken or in denial of being wrong. Therefore when we adopt a belief we can make a mistake in either adopting a wrong one or interpreting a correct belief in an incorrect way. We don't give in to charge easily either. We will fight tooth and nail before we admit to being wrong. We truly feel we are always right, and this has caused people to hate one another to point of genocide. There's even a new field of study regarding this human trap: wrongology. When an anonymous poster suggested I was defending the NABRE footnotes and that they themselves had no need for the critical or fail-safe approach used therein, I pointed out that they were very mistaken. I wasn't supporting or defending the NABRE footnotes at all, merely pointing out they were not commentary. The fact that the poster did not realize they were mistaken about my words proves that they themselves could have benefitted from a critical review of their own thinking process that led to the mistaken conclusion; i.e., proving a critical eye can be beneficial to preventing wrong interpretations. But I had to do it in a way that wasn't saying: I am right and you are wrong. I couldn't because I am often wrong about things myself. "But for the grace of God, there go I." We can all therefore benefit from some critical thinking now and then as to prevent us from not only making mistakes but losing face from doing so. I was not however outlining a harsh disciplinarian way of life for myself. I was just saying that I try to incorporate a humble way of doing things in life because sooner or later I will make a mistake and will likely be too stubborn to admit it—at least at first, I hope. I was thinking of getting this new Didache Bible but I am still working through the last one. I still have too many NABRE Bibles (even after giving a couple of them away). And I just bought a mint 1994 NOAB in red leather on ebay (for $25), so I have my fill right now. I have to stay off ebay it is killing me! I suppose having both approaches of explanation give a very vast room for understanding the Scriptures. Thanks to Dei Verbum and Divino Afflante Spiritu for opening that doors for us. Let me bring into the discussion the Church's rationale for the biblical notes. As per the Canon Law requires, all translation of the Scriptures approved by the Church must bear (take note, it's mandatory) notes for the purposes of greater understanding of the reader. However, that one did not specify on the quality of the notes required. As I see it, biblical notes may fall into a spectrum. Human side on one end and Divine side on another end. Being too human makes the Scriptures analyzed and interpreted by humans according to logic, losing its attribute as God-breathed, turning it into an ancient artifact. Being too divine may end up the Scripture as a mystical book full of mysteries and thus incomprehensible to human understanding. What we need as Catholics is to get the optimum level of both ends, being divine, using it as a tool for us to attain holiness (of course, as Catholics, not Scriptures only) at the same time being human so that we can practically apply the road to holiness. Along that spectrum, there is the line that draw the heresy and the acceptable level apart. If we are going to be very specific, we can divide the acceptable level into two divisions, the liberal and the conservative sides. So if we are to designate the areas from left human side to right divine side, it may go this way, from L-R: too human, heretic, liberal, conservative, too divine. I think there will be no consensus on which of the two sets of notes are acceptable to every reader, ultimately, it depends on his appreciation of the logical and the divine truth. I just only realized this fascinating analogy, perhaps due to Greek play of words. Human is operated by LOGIC on his thinking. Meaning that Jesus, being the Word (LOGOS) and the source of the divine LOGIC. You are absolutely right and your comments show great insight. Just one thing, and I believe that some Catholics are not aware of this, but there is no such thing as Catholic Conservatism or Liberalism. These divisions are secular which have invaded the Church and which people from both sides of this spectrum have used to politicize issues and introduce party divisions into the Body of Christ. Those who say they are a Catholic Conservatist or Liberalist are speaking about their political convictions and their identification with the mores promoted by these groups. Doctrines, theology, and hermaneutic approaches are not of themselves "Liberal" or "Conservative." People who subscribe to these ideologies may make claim to this or that doctrine or exegetical process or reject it, but these things of themselves are not one thing or the other. To confuse matters a bit, the liberal/conservative divide of the Culture Wars often causes people to confuse these concepts with "religious liberalism" (the use of modern research methodologies) and its opposite "religious traditionalism" (the use of ancient modern research methodologies). These terms refer to approaches used before and those introduced after the period of human history known as the Enlightenment. "Divino afflante spiritu" is the Church's response to the Enlightenment, not the Culture Wars of current society which divides itself among conservative/liberal socio-political lines. That's why I divided first between heretic and the acceptable ones. Being secular is dividing the acceptable level as liberal and conservative. In my view the notes of the NABRE (and its predecessor versions) are both an embarrassment to the USCCB and a primary indicator of the orthodoxy of that body. Neither of which impress me positively. The Catechism teaches that the Bishops in union with the Holy Father are the teaching authority of the Church. We should not be so quick to condemn the NABRE but instead we should be more willing to condemn our own limited understanding. "The Catechism teaches that the Bishops in union with the Holy Father are the teaching authority of the Church." What makes you think the bishops are in union with the pope? Seriously, that's just an assumption. When some bishops were actively resisting papal efforts to correct the translation of the Mass were they in union with him? If a NAB/NABRE note encourages modernism how is that a good thing? "We should not be so quick to condemn the NABRE but instead we should be more willing to condemn our own limited understanding." Maybe our understanding is not so limited. Maybe it is the bishops who have limited understanding in this matter. After all if a note or introduction in the NAB/NABRE actually runs counter to longstanding Catholic tradition, who is the one who lacks understanding? It is an act of mercy to encourage bishops to do the right thing. They risk eternal damnation if they teach error to their flocks. It is our DUTY to help them get to heaven just as it is their duty to help us. I appreciate your comments, however I disagree with you. The specific footnotes I cited are not textual or etymological in nature, rather they are expository and exegetical. On this specific questions of why the author sometimes switches to plural pronouns, especially when it appears he is quoting God, there is no established consensus. The researchers who wrote this note say it refers to the assembled host of heaven, Christian tradition reads a reference to the Trinity as MTF notes, and Jewish scholars usually teach that in Hebrew the plural pronouns here convey more reverence and authority that is due to God. If the Bishops Conference is going to require an exegetical note to be included here, why not explain several of the various possible explanations. And if only one explanation is going to be provided, I simply feel that the Bishops should promote the one that is the Church's teaching. If being interested in historical-critical analysis of the Scriptures , archaeological studies of the Holy Land and the relationships between the Romans, Jewish religious leaders and the first century Christians is 'modernism', then I am a 'modernist.' I equally enjoy reading the critical notes that come with the NABRE and the Didache's theological/liturgical notes that come with this new Bible! I think having them together is a good resource! Rolf's point is that Christianity didnt exist before Jesus came, as it is obvious. What he is saying that history before Jesus that is helpful for our Judeo-Christian understanding is also essential and that did not make him modernist. In fact, you'll see the New Testament in a brighter light if you are to be fully aware of the Judaic customs, such as the folding of the linen of Jesus' burial cloth. Am I modernist to say that Jewish boys in the Judaic custom, when their masters just left his dining cloth, it would mean that his master is finished eating. But if the master folded his dining cloth after leaving the table, it means that his master will come back and will resume eating after some time. That being said, Jesus' folded burial cloth gives an impression that Jesus really didn't leave and in fact returning for His second coming. That's being historical-critical, but that doesnt make me a modernist. I think the NABRE footnotes dialogue well with the more theological/pastoral notes. Alternatively, the latter presents a particular Catholic interpretation of the sacred texts within their cultural/historical contexts. They don't have to be seen as contradictory. That said, somehow I can't bring myself to purchase an Opus Dei thing :P.
We can argue and debate all day long, but in the end it's not what we think about any particular Bible translation that counts. It's how clear the Bible shines through in the lives of each of us. Let's say that there was an inarguably more correct Bible version than anything other that existed. Let's say we read and study it daily. If it does not change how we treat, respect, and care for others then what good is having that perfect Bible translation? If we are not becoming kinder people, if our actions do not speak louder than words, if we do not live lives of self-sacrifice in service of our neighbor feeding the poor, caring for the sick, welcoming the stranger, befriending the jailed, staying with the dying in their last moments then what benefit does a Bible translation have regardless of how perfect it is? (Matthew 25:31-46) Did not St. Paul remind the Romans that possessing, reading, studying, and knowing the Law did not prevent a person from being a sinner? (Romans 2:17-29) Which speaks louder, our enlightened opinions for or against the NABRE and it's footnotes or the power of the Gospel in the love we are known for? Have you never read the scripture: "Knowledge inflates with pride, but love builds up"? (1 Corinthians 8:1) Have we forgotten the words: "Who among you is wise and understanding? Let him show his works by a good life in the humility that comes from wisdom"? (James 3:13) Let each have their opinions and let each respect the other's. But avoid making claims you cannot prove here or in the life you lead. Again it is written: "Demonstrate your faith to me without works, and I will demonstrate my faith to you from my works." (James 2:18) In the end it is not what I believe that proves my faith in the message or how well that message is presented, it's the abundance and efficacy of my works that proves the message's worth. Vladimir, eternal damnation? Really? What's this great resistance that you're referring to? Bishops are not allowed to make suggestions for their own flock? If the Pope says "jump" all the bishops are supposed to say, "how high?" We've really gone off on a tangent here. For all the positive reasons that everyone else has expressed here, I look forward to receiving my NABRE Didache. In the end, I may just end up giving it to my pastor. As-salamu alaykum, brothers and sisters. You wrote: "Vladimir, eternal damnation? Really?" If a bishop teaches error will he be rewarded or punished? Wasn't it St. Athanasius who said, "The floor of hell is paved with the skulls of bishops." He, of course, was referring to bishops who embraced Arianism, but the principle is the same. Teaching error is something every bishop should avoid. I never used the word resistance so I have no idea what you mean. Suggestions contrary to the faith? No, never. If what he is saying is both orthodox and prudent, yes. In fact, your bishop should do that for YOU as well. If you tell a bishop something that is orthodox and prudent he is duty bound as a Christian to acknowledge and agree. If you say to a bishop, “Christ rose from the dead” is he not bound to say, “Amen”? If you say, “A bishop must run his diocese well,” is he not duty bound to agree in principle? There might be disagreement over what that means, but there can never be disagreement over what is recognized by the Church as orthodox and prudent in itself. Perhaps, but my comment was specifically about what was posted by someone else. I ordered one as well and it should be here shortly. The fact that I want a copy does not detract from the fact that the NABRE could be better with better notes. The NABRE OT is much better than it once was. The NT will be revised next. Let’s pray that goes well! As is typical in the Church, the answer is both/and, not either/or. Gen 1:26 was both originally understood as God being the "speaker of the house", as you say, and later known to be a veiled revelation of the Divine Trinity in the centuries after Christ. The problem is the NABRE notes are written from an almost purely historical-critical perspective, to the neglect of the traditional-theological which is more common in Patristic understanding. The NAB note is written from HC, the Didache from TT exegetical POV. What the 2025 NAB needs to do is not focus solely on the one meaning of Scripture. Scripture is both historical and spiritual, and the spiritual meaning is further divided into allegorical, moral, and anagogical (heavenly). We need to push for modern Biblical scholars to back off the HC extremism and temper it with traditional-theological methods.